It is that time of year again when our children's systems are inundated with cold and flu bacteria. Being in school, or just having cooler weather that keeps people indoors more, tends to lead to more germs flying around. Common for illness is antibiotics to cure the youngster of their germs. Probiotics are just as important to retain the healthy bacteria in a child's stomach and body. KidsLac Probiotic comes in individual sized packets that you mix directly into a beverage or sprinkle on food. Easy on the tastebuds, this is a sour apple flavored supplement. I mixed it for my daughter in ice water and it dissolved very nicely for her. She drank it without any fuss, which for an 8 year old is wonderful! My daughter often has to take Miralax due to stomach issues and constipation. I wanted to try out the probiotic to see if we could get her stomach in more of a natural order. The first round of the Kidslac caused her to have diahrrea and bascially empty out her system. For someone who struggles to have bowel movements this could be a good thing. I have been hesitant though to try more as we haven't been home on a consistent basis. I think once her system got used to it, she would actually have an easier time with fewer stomach issues. We will continue to try out the KidsLac Probiotic to see if we can get her system regulated and healthier. 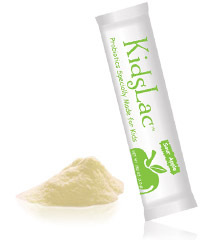 Enter to win KidsLac Probiotic!! Very interesting! I will have to look into them some more for my kids! Thank you for sharing! I like the page where they tell you how to test at home if you have a yeast problem. 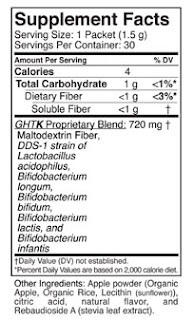 It contains 5 strains of healthy bacteria! That it has 5 different strains of healthy bacteria to help balance the bacteria in kids' tummies.